– Served as Dean from 3/11/1964 to 18/11/1970. – Received a Bachelor degree in Medicine and surgery 1939. – Received a doctorate in internal medicine from the Faculty of Medicine of Alexandria in 1945. – Worked as a privilege doctor in el Kasr Al Aini Faculty of Medicine, Cairo in 1940. – A resident at the Faculty of Medicine, Cairo in 1942. – Then he attended to Alexandria, and worked as a clinical doctor in 1944. – He was appointed as (teacher a) at the Faculty of Medicine – Alexandria in 1948. – Then he worked as Assistant Professor (b) in 1950. – Then he worked as Assistant Professor (a) in 1952. – And then was appointed as professor in 1958. 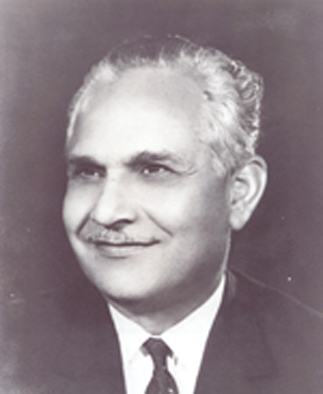 – And then was appointed as Dean of the College from 3-11-64 to 18/11/1970. – Then head of the internal medicine sections from 1/7/1976 to 31/8/1976. – was appointed as Minister of Tourism in the 22/11/1970, and then Minister of Health and an adviser to the President of the Republic. – Used for the first time the education in other hospitals (“Ras elTeen“hospital ,Damanhur hospital in addition of General Hospital and next to the university hospitals. – After that, the Children’s Hospital has joined the university education, which was built recently in the courtyard of el shatby hospital with four floors and was officially opened in 30.7.1970. And to encourage students to study he started a new system for the first time in the Egyptian universities to allocate 20% of the degrees of each subject for the acts of the year. – Set up a scientific association for students of the college, which was the first scientific association of its kind in Egypt and was supervised by Dr. / Abd al-Majid Sadiq. – he has contributed and encouraged voyages of the students to foreign universities in Europe and America to take advantage of scientific training . – The children surgery specialty has been designated a role in shatby Children’s Hospital under supervision of Dr. / Elsayed Akkari. – Development of the college library and renovation of library furniture and provided it with the most important scientific journals periodicals. – The Faculty of Dentistry Has been independence from the Faculty of Medicine. – The academic building sections have been equipped by facilities and laboratories to serve the educational process. – Decided to circulate the work of Masters and PhDs of all disciplines after it was limited to only master. – The construction of the University Hospital Children – in elShatby courtyard and was officially opened 30/7/1970. – Completion of the construction of sector (d) in the building of surgery. – Created a special emergency section for Men and women includes two surgery rooms in the basement of old hospital building. – set up a special unit for burns separate from the Department of Surgery. – set up a special unit for intensive care. – Held for the first time the economic treatment project in university hospitals and that was a new idea. – created a awaken rooms next to operations rooms in all the floors of surgery departments. – set up several analysis laboratories in each unit of surgery, and internal medicine, and other departments. – An Anatomy building was opened at the entrance to the college where a student’s lectures rooms was established in 1966. – Established for the first time a club for doctors within the College in the ground floor of the academic building. – To promote medical cooperation between Egypt and African countries he began in sending medical convoys for treatment to those countries.